Samira A. Nazem is the CBF’s Director of Pro Bono and Court Advocacy. Samira leads the CBF’s advocacy efforts with the courts for policies promoting access to justice, including policies that make the courts and administrative agencies more user friendly for people without lawyers. She also leads the CBF’s pro bono efforts, working with lawyers, firms, corporations, the courts, and pro bono and legal aid organizations to maximize the impact of pro bono work. Prior to joining the CBF, Samira was the Self-Represented Litigant Services Specialist for the Administrative Office of the Illinois Courts. She also previously served as a Staff Attorney and Pro Bono Coordinator for the Lawyers’ Committee for Better Housing, as a Litigation Attorney for the Chicago Housing Authority, as a Fellow at the Legal Assistance Foundation, and as a summer associate for a major law firm. 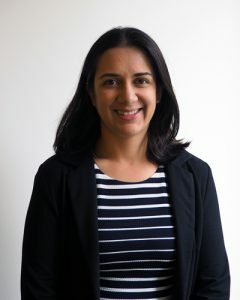 Prior to her legal career, Samira lived in Mumbai, India where she worked for an NGO advocating for women’s rights, and in Washington, D.C. working at an education think tank. Samira received her law degree from the University of Chicago in 2010. During law school, she participated in the Immigrant Children’s Advocacy Clinic and the Poverty and Housing Law Clinic. She received a B.A. Degree with distinction from Yale University in 2004. A proud native of Omaha, Nebraska, Samira has resided in Chicago since 2007. She currently lives in the Lakeview neighborhood with her husband and two daughters.